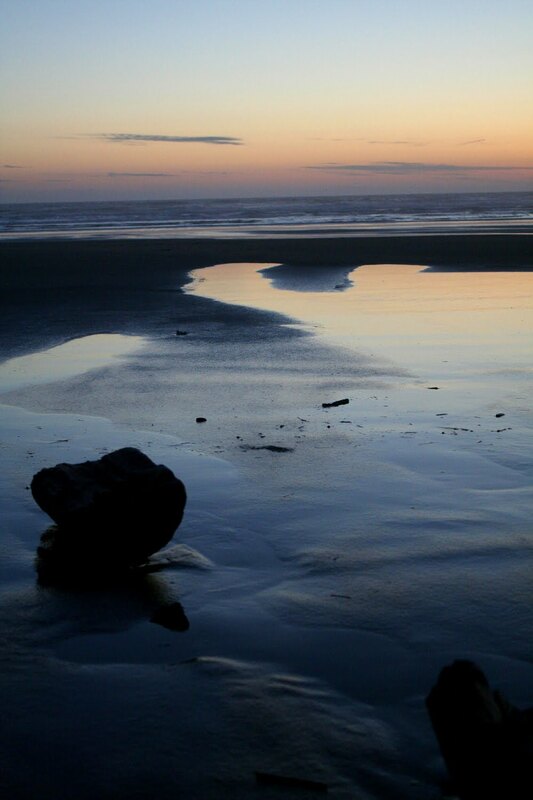 Oregon has the best tidepools and sunsets! 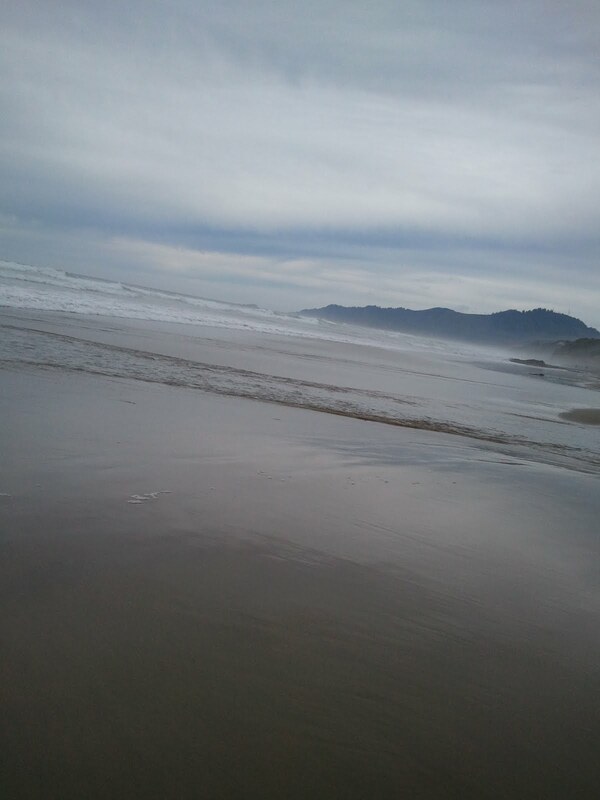 Busy busy on the Oregon coast! I'm home now! In a couple days, I'll add some from my visit to my dad's Crackerbox palace (aka log cabin in the woods) and a few others from my trip to Portland. 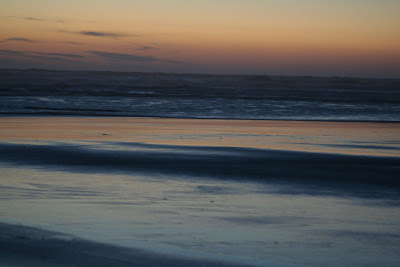 But for now, I wanted to post the final images from the Central Oregon coast. 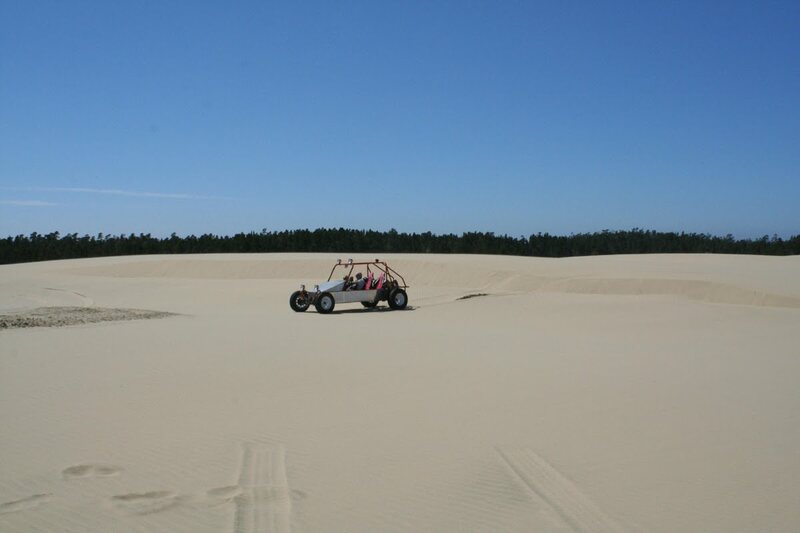 On the last day of our trip (Friday), we went on a truly crazy wild dune buggy ride at Sandland Adventures. 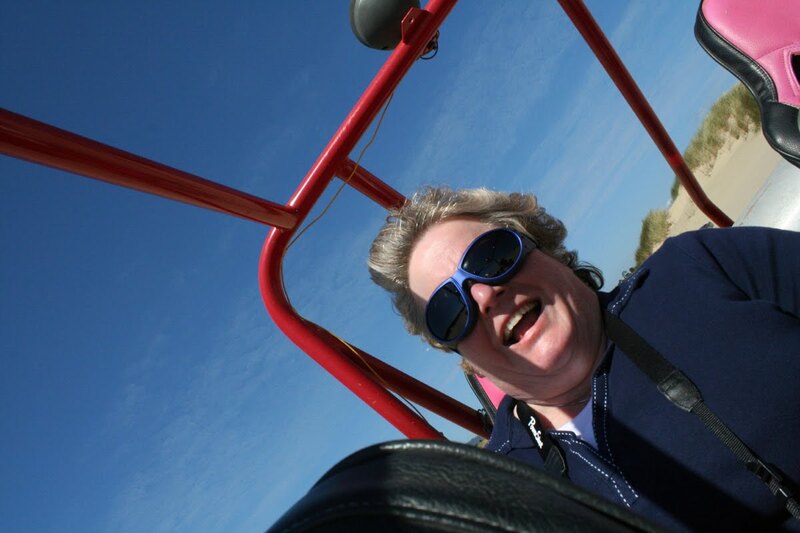 The dune buggy ride at Sand Master Park had nothing on this one! 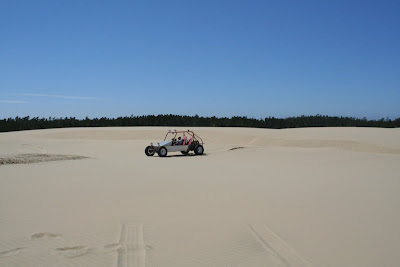 We met the dune buggy driver at the Oregon Dunes National Recreation Area which is technically part of the Siuslaw National Forest. It was an absolutely beautiful area, with mountains and evergreen trees but with miles and miles of cafe-au-lait colored sand dunes - but we were told not to bring cameras or cell phones because if it gets lost in the sand, it's gone for good. And the dune buggy ride was like a roller coaster. We were strapped in tight and thank God for that! We went down several extremely high and steep dunes - the highest being a whopping 390 feet drop! I thought it was quite fun and it gave me butterflies but not everyone in our group was loving it! Riding in the buggy up and around and down the dunes can be a massive adrenaline rush especially if you don't like heights or not being in control... And lack of control is an issue I have devoted the last few years overcoming and I can honestly say I am not really scared of flying anymore (though I had some mild trepidation before up in the helicopter the day before, I did it and was not scared!) - and I can also imagine that if the driver had pushed it just a little bit more, I probably would've been a bit scared. But I had a blast! So, after almost dying (ha ha - just kidding) on the dune buggy ride, we headed to a much calmer experience in historic downtown Florence. 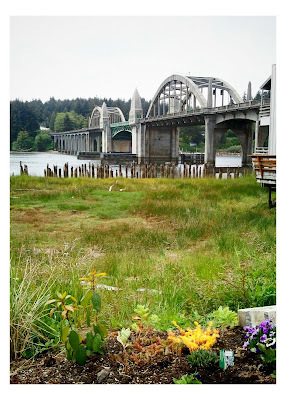 We checked out this yummy bakery (which had a delicious gluten-free cheddar-dill scone) and then went to the Siuslaw River Coffee Roasters where I had a soy misto redeye, with Mexican chocolate...and then we wandered around a bit and shopped. And while out, our fearless leader Rebecah decided she wanted to sit on some motorcycles of these guys who were on the street. So we did. And borrowed their jackets. I didn't get a shot of Rebecah but below are a couple pics of me and Eileen on our turn on the bikes. No, we didn't ride them! 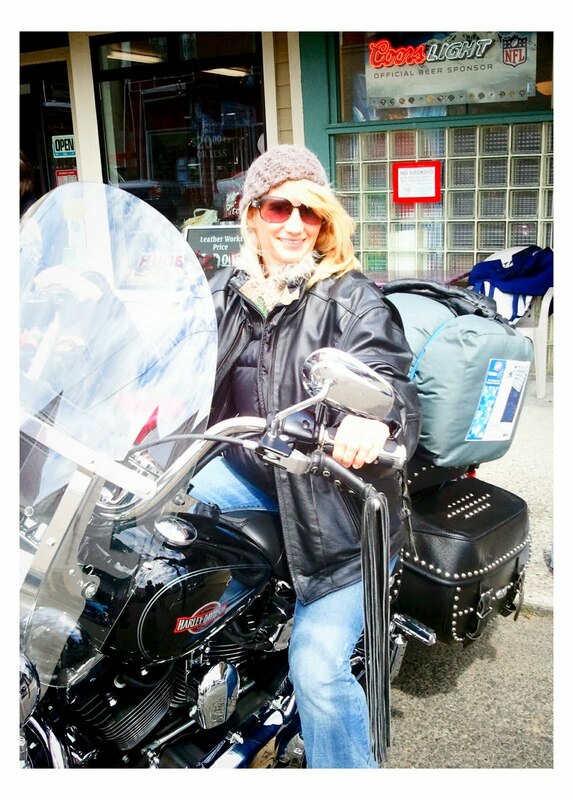 Me on the bike. I would never drive a motorcycle - too scary! I have ridden on several in the past, but couldn't do it on a regular basis. Drivers are just too careless...Would you? One of Conde McCoullough's famous Oregon bridges - in downtown/Old town Florence. After this, we headed back to Newport where our cars were, but not before stopping in Yachats (pronounced Yah-hots) for lunch at the Green Salmon Cafe and Teahouse, a place recommended to me by one of my Twitter followers (follow me on Twitter here)! It was awesome! Here's their menu. I had the sustainable tuna melt, and this delish ginger coffee - called Kopi Jahe. 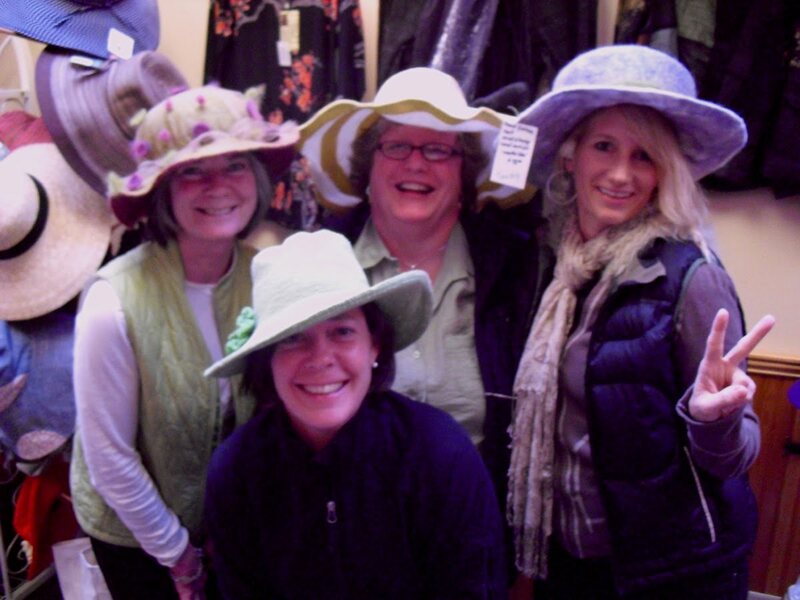 We took this silly hat photo at The Drift Inn restaurant in Yachats the night before - which had a really diverse menu and good food. The place had a quirky feel, which made me feel right at home! 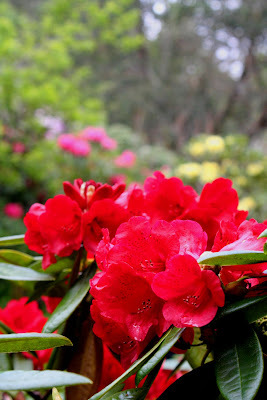 It had some info about the Oregon Country Fair, which naturally made me think of my brother! Anyway, after saying our goodbyes, we went our separate ways. 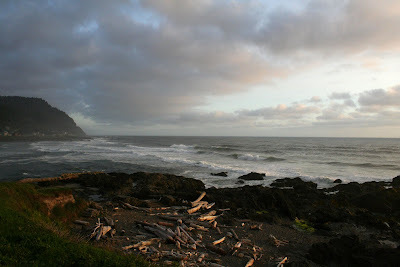 My flight didn't leave until midnight, so I drove slowly back to Portland via the coast. I decided to stop roadside and watch the ocean for a while. This spot just north of Newport is where I stopped, photographed, relaxed, journaled and listened to the waves. 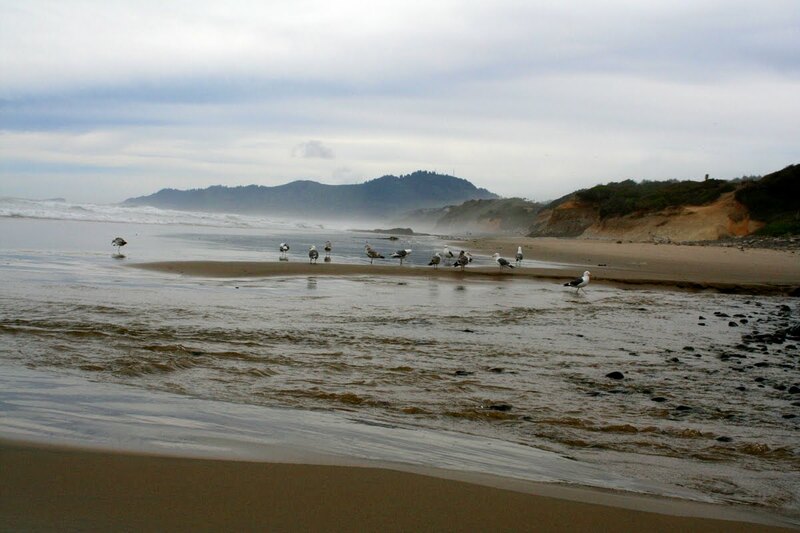 These seagulls were all hanging out where the freshwater creek spilled into the ocean and after a bit of watching them I realized they were drinking the water. They were also splashing and bathing in it! I didn't know seagulls bathe in the freshwater, but they certainly did. Ya learn something new every day! 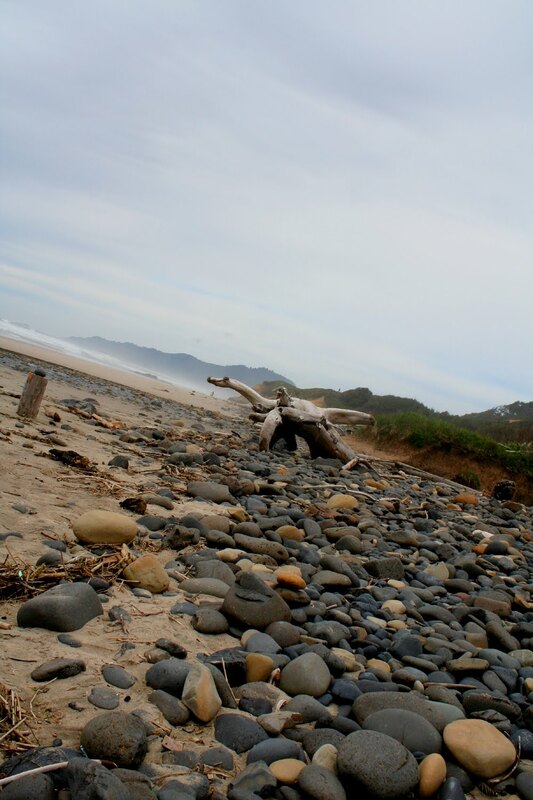 Another shot of the area - love these rounded river rocks. And a view of a large piece of driftwood! After staring for a while, I also noticed that there were these pillars of sand on top of the larger rocks in the creek bed. Pretty cool. The wave is chasing me! So, until next time... Which may not be too far away. 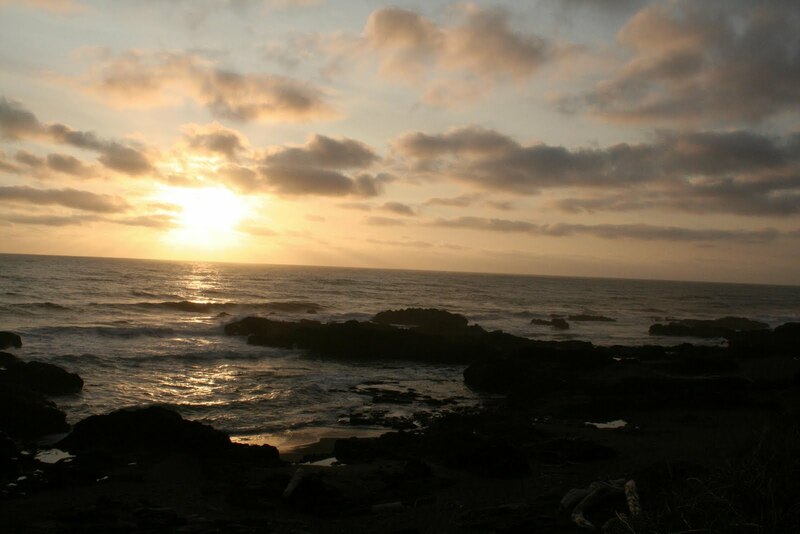 I am taking my kiddos on a summer trip to California so my daughter can look at a few colleges and originally I was going to go to San Francisco and then drive south to L.A., now I'm thinking seriously of driving north to the Oregon coast instead and taking my kids to experience some of this awesomeness! I need to pitch some articles on the cool stuff I saw! The ones I'm leaning towards are sandboarding, the Rogue Brewery, and some family travel pieces. Oh and some culinary/food ideas. Oregon is big on farm to fork. And did you know that 99.9% of commercial hazelnuts come from Oregon? See now you have learned at least two new things today! 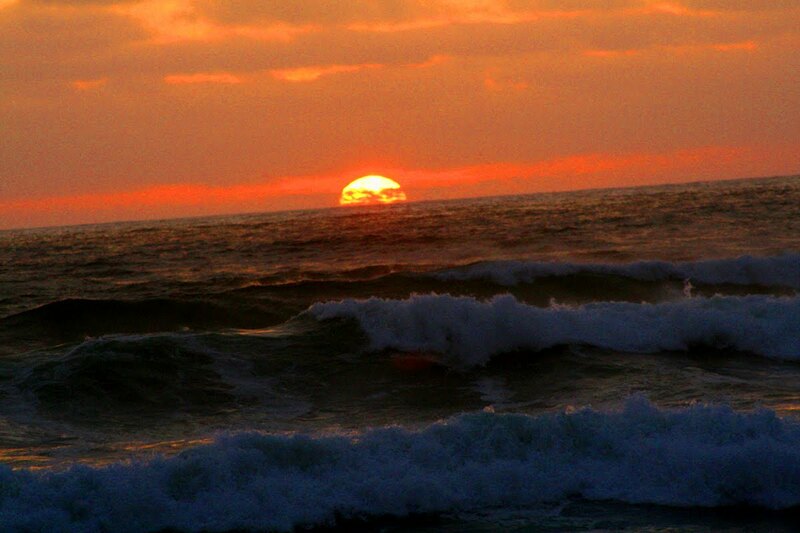 The orange-colored seastars are so bright you can easily spot them across the way as the waves crash on the rocks. But look up close, and what do you see? 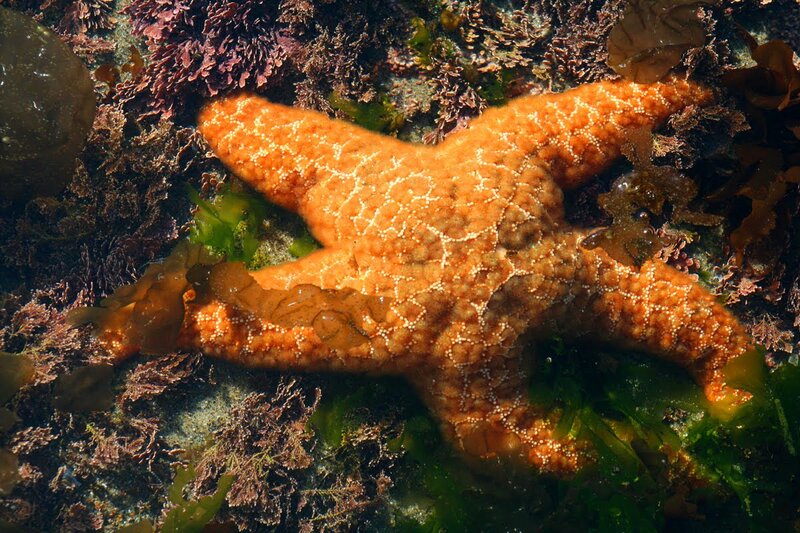 This starfish has a smiley face on it!! I swear I did not Photoshop that in either! 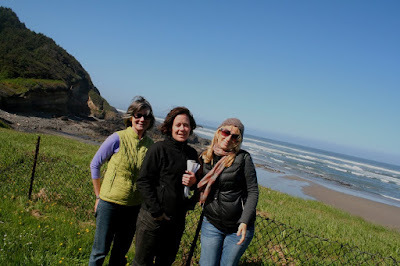 After exploring the tidepools, we went to Sea Lion Caves, a private enterprise north of Florence on the Central Oregon coast that has a great view of an overlook where hundreds of Stellar sea lions haul out to mate and have babies every year. Birthing will happen next month, so any of the younguns you see in the pics below are yearlings. These are a different species than the California sea lions that we saw on the dock in Newport. You can see how gigantic the Stellar males are - they are massive! Stellars are quite a bit larger than California sea lions, and the folks at Sea Lion Caves told us that they generally do not haul out together. 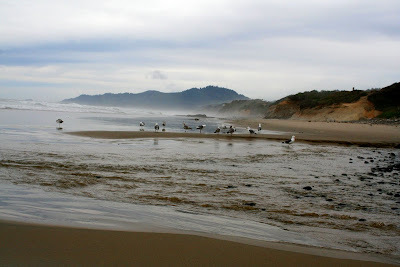 However an interesting sidenote is that when all the sea lions disappeared from the San Francisco Pier 39 in Nov 2009 (which I wrote about for Animal Planet), they showed up in Oregon, right in this same area! They can't be 100% sure they were the same animals since they are not tagged or anything, but it seems likely. 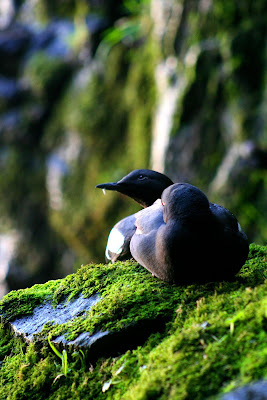 I also blogged about their return in May 2010 for Animal Planet. A shot of the sea lions from a perspective of many feet above. Now I swear I didn't Photoshop this either but what the heck is on that one sea lion but ... the mark of the beast! The number 666 is clearly etched on its skin - the antichrist sea lion! I'm wondering if a biologist marked it for research purposes. I have to show this to the Sea Lion Caves folks - maybe they will know. It could have been an injury because another sea lion we saw had fresh wounds on its fur, but I didn't get a photo of that one. A big daddy sea lion! 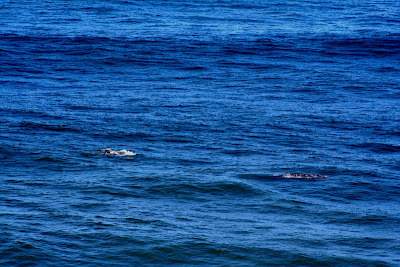 While watching the sea lions with binoculars, we saw some gray whales passing by! 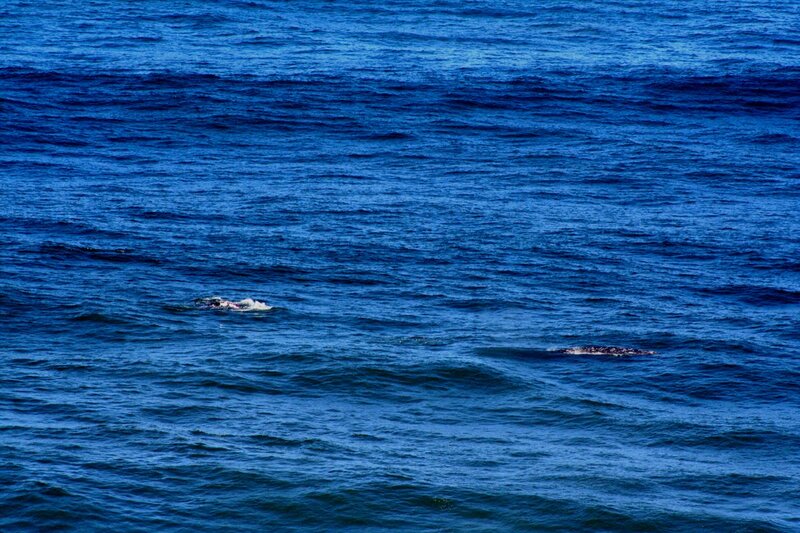 Another shot of the gray whales. One of the best ways to spot whales is by their blow, and then if you watch the ocean for a while they will surface. 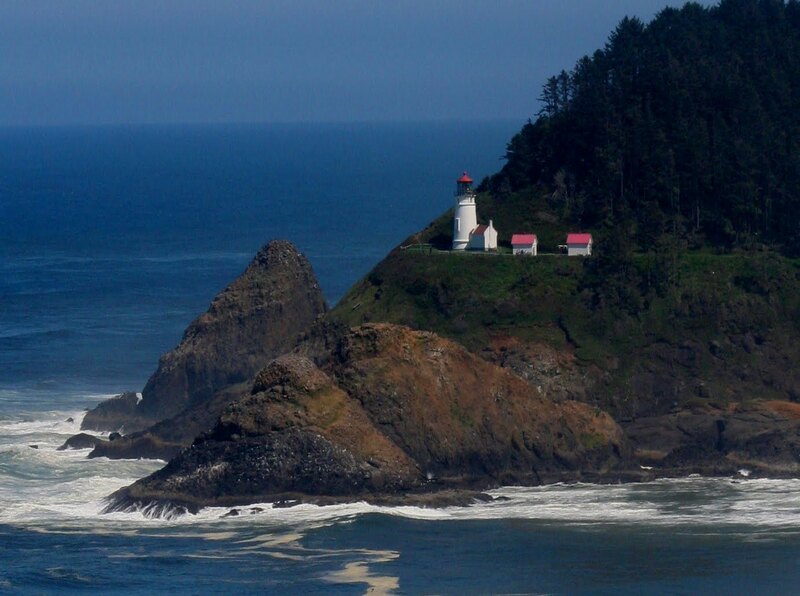 The Heceta Head Lighthouse is also visible from Sea Lion Caves. It's apparently one of the most photographed in the nation because of the great view on roadsides and other spots like here! Another feature of Sea Lion Caves is that they have an elevator that takes you down some 200 feet below to the world's "biggest sea cave" - and thgough sea lions normally don't hang out there this time of year there were some. All my pics were out of focus but I wanted to show this view of the cave - minus any sea lions. Underground they have some interpretive displays as well. Out of one of the cavern walls, you could see this nesting pair of pigeon guillemots. While there I ate my lunch on a bench overlooking this beautiful view... with a bird perched in the treetop. 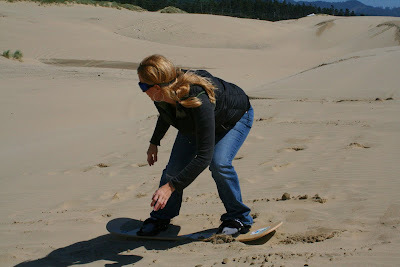 NEXT we went on another adventure - sandboarding lessons. It was SO much fun! I didn't even know sandboarding existed! I had so much fun. We got 30-minute lessons from 2 sandboarding champs, Gabriel and Joey, who work at Sandmaster Park in Florence, which was started by Lon Beale who was a pioneer of the sport in the 1970s and helped create the sand boards, as well as Dune Riders International - a governing body of the sport. 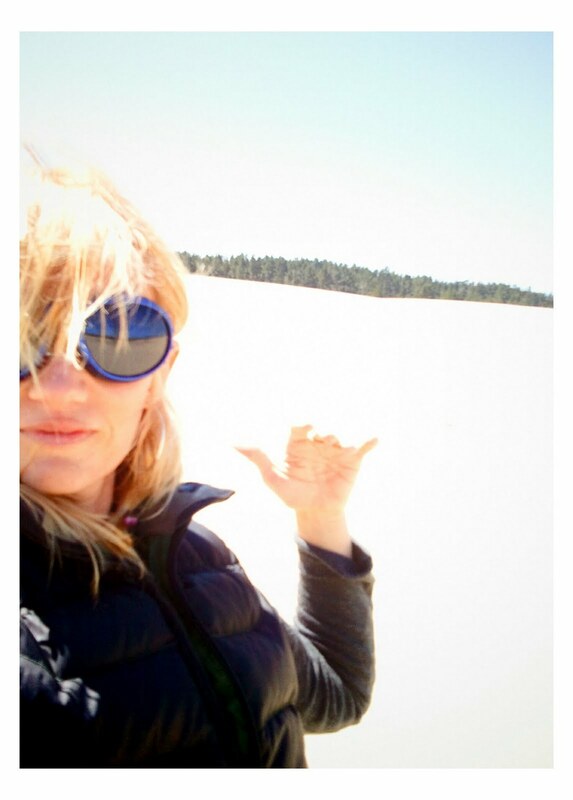 They created a park dedicated to sandboarding, and rent boards and offer lessons. We just went on the bunny slope! Check out the cool video of people sandboarding. But I did fall once! 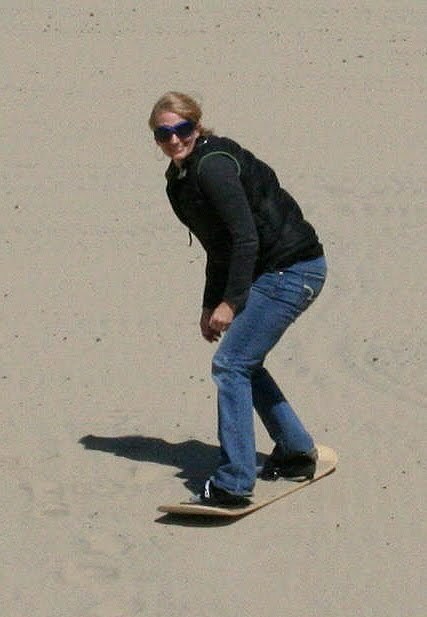 Cruising down the sand hill - woohoo! 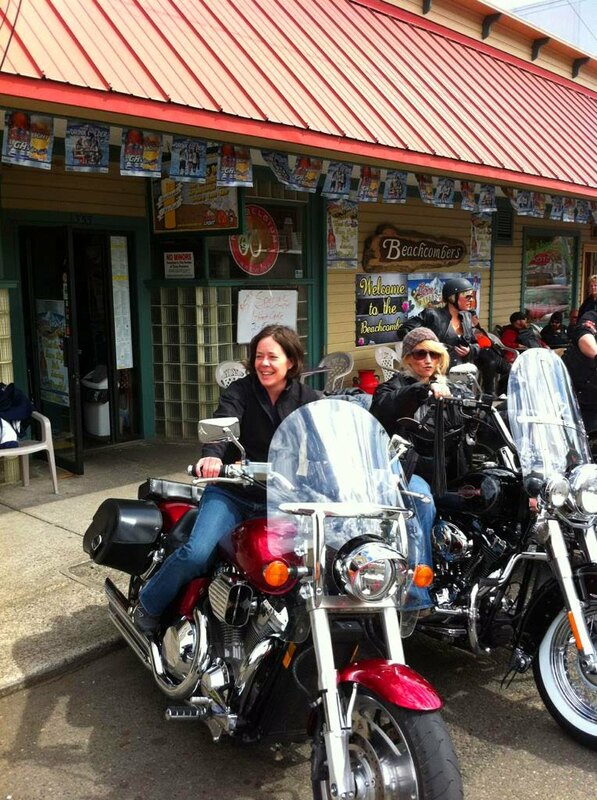 I rode with Rebecah - doesn't she look like she is having a blast! This one was definitely milder than the 390-foot drop we would do the next day at Sandland Adventure Park! I didn't get any photos because it's a freaking wild ride and they recommend you not take anything along. This is an accidental photo I took with my phone that turned out pretty cool. Hang ten! This is one of the instructors, Joey. And as if we hadn't already squeezed in enough adventure for one day, we next went on a helicopter ride over the coast with Apex Helicopters, which just moved to Florence from Bozeman, Montana. 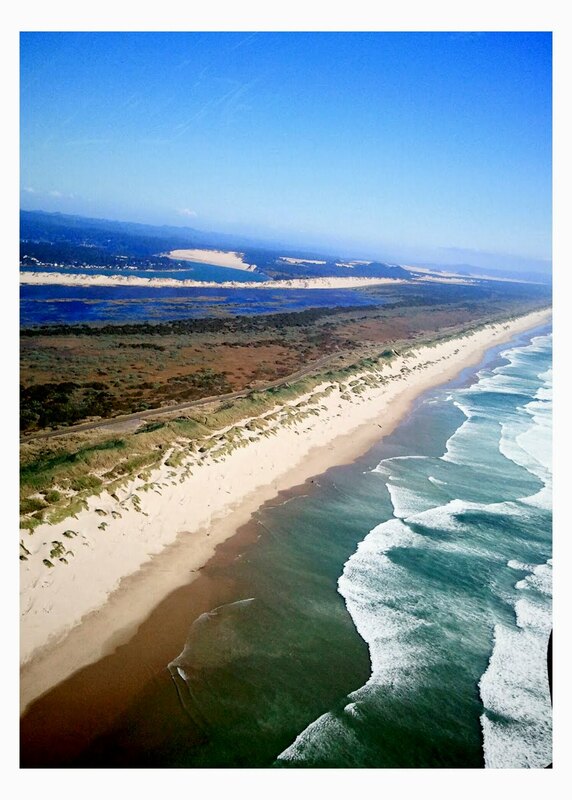 They will no doing sunset and other coastal tours as well as flight training. 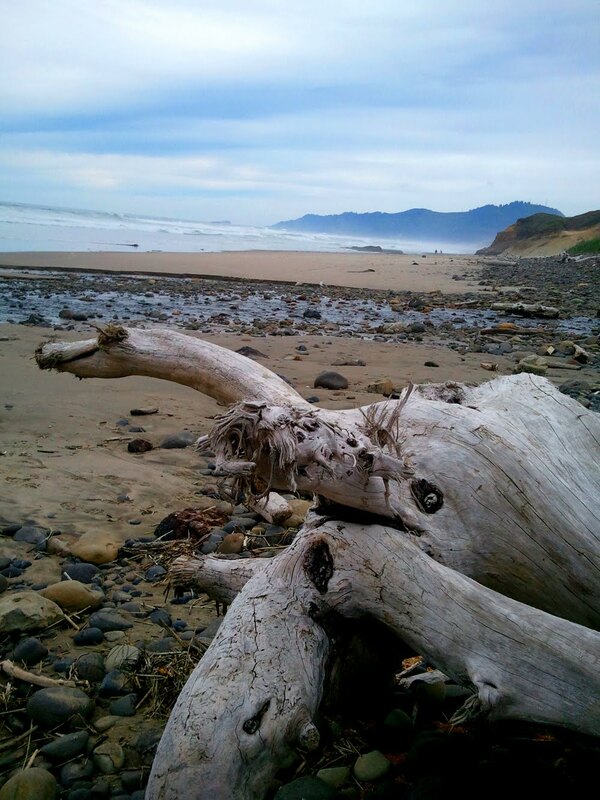 Driftwood on the beach in Florence outside of the Driftwood Shores hotel. Pat, Eileen and me on the roadside at one of the roadside pullouts we stopped at for photos. 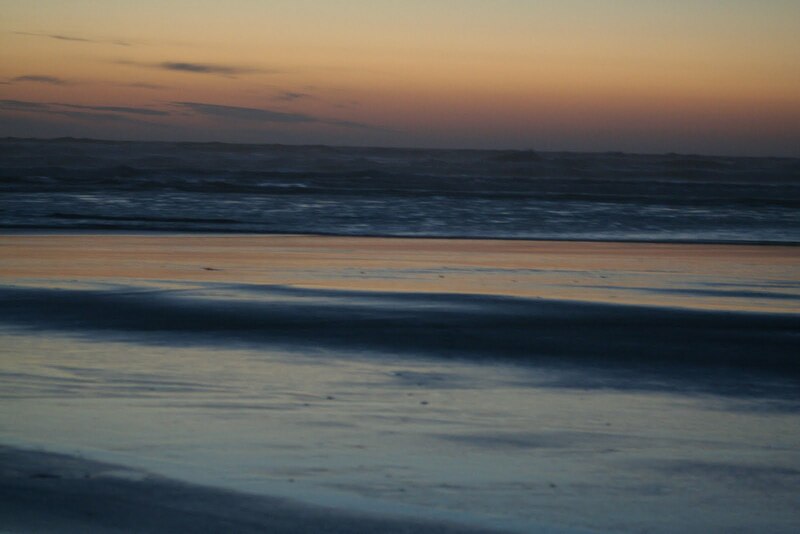 Yesterday was filled with SO much fun - my first time sandboarding, flying in a helicopter over the coast, eating more delicious food and exploring yet more tidepools but last night's sunset blew me away so I wanted to post these. 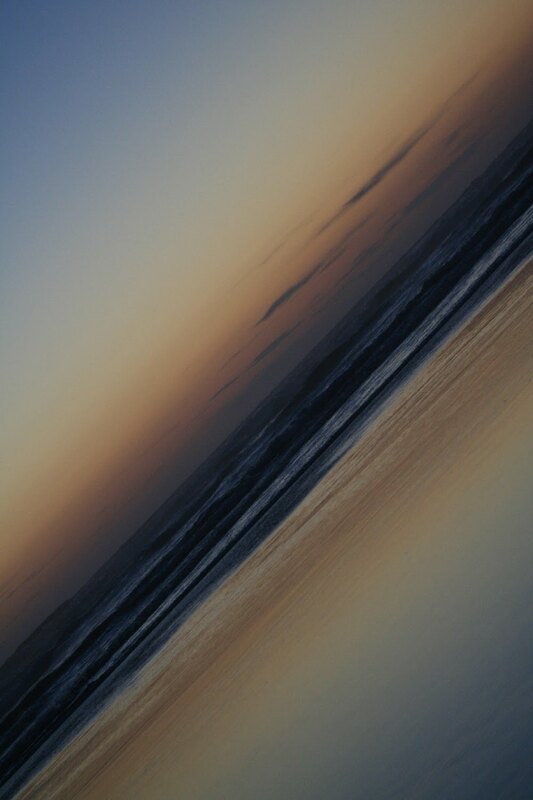 The beach is very flat in Florence. It is very interesting how the coast changes as we have gone further south even staying within the central part of the Oregon coast. First there's jagged rocks and islets offshore, then the lava flows (like the Galapagos or Hawaii) and now just dunes and flat beach. To the right in this image is a lighthouse that is one of the most photographed in the nation due to its location and a nice pullout on the road. It's called the Heceta Head lighthouse and that point is Heceta Head (We also had lunch at the lighthouse yesterday). 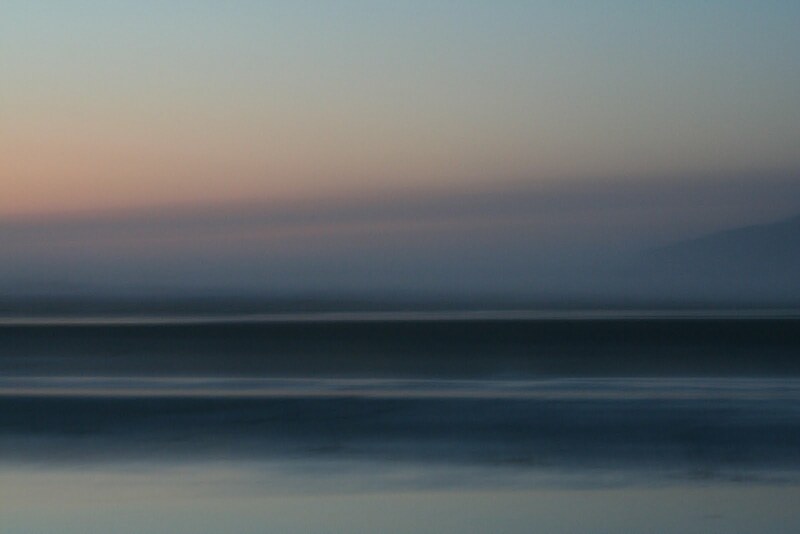 I tried to get a shot with the blinking lighthouse beacon but alas I didn't succeed. 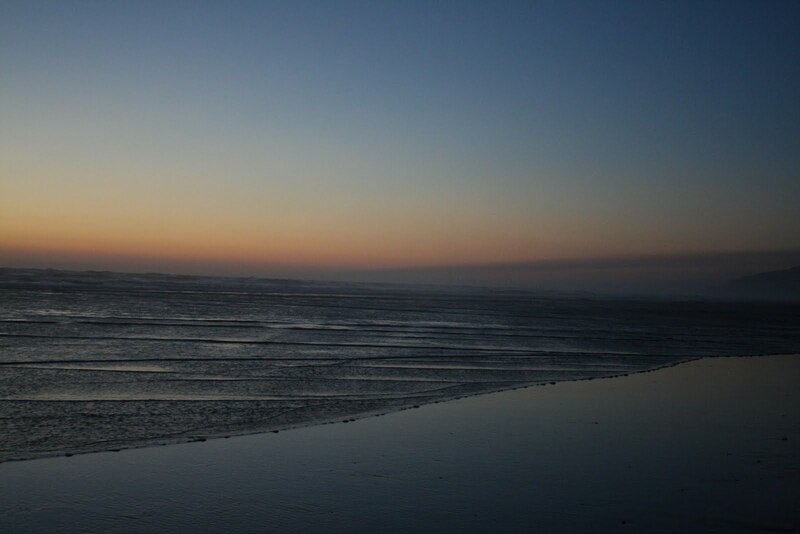 Because the beach is so flat you would get these rivulets of water that reflected the light. Just gorgeous. My hands were freezing when I finally came in. 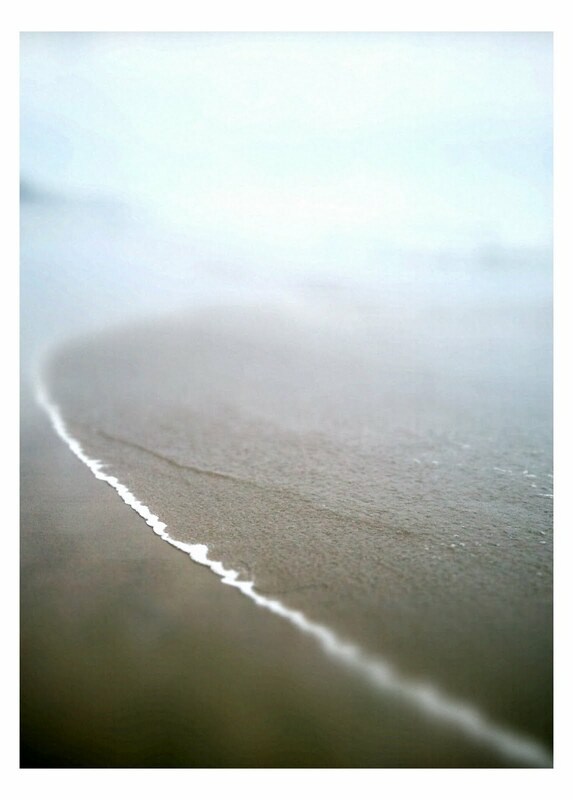 The waves rolling back out to sea. Nice quilt-like juxtaposition of the landscape here. A rolling wave. I didn't actually see the sun going down, because I was in my room! I got out there afterwards but the view was worth it. Hope you enjoy! Yesterday morning, we woke up and went here... this is Gull Rock, just offshore from where we stayed the night before (Inn at Otter Crest - another very nice resort on the Central Oregon coast with huge rooms sitting up on a bit of a cliff). 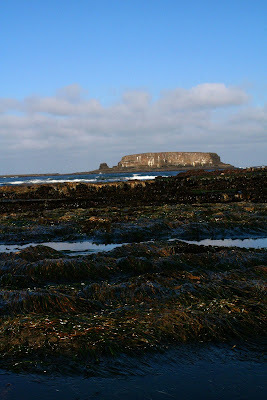 We explored the tide pools which for an ecologist - well it just doesn't get much better than that! (Funny - I accidentally typed idea pools instead of tide pools. I kind of like that!) 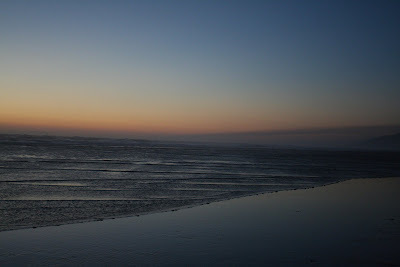 The tide has been low every morning and evening right about the time we have had to explore, so that has worked out well! A sea urchin that got eaten by something. Sea otters particularly like urchins. A closer view. Love the purple! A purple ochre sea star, green anemone, sea urchins exposed at low tide. I thought this was so cool. It's some sort of algae/seaweed with "bladders" that probably make it float. 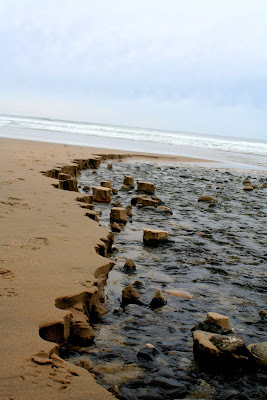 A "wall" exposed by low tide. I'm not exactly sure how those circular half-holes get formed but you can see some are filled by seastars and anemones. Look closely and you can see some irridescent seaweed above. A closer view of another section of the wall with oodles of sea stars, and overhanging seaweed. As we were walking back in, we spotted this harbor seal hanging out. I love all the colors of the various seaweeds - reds, greens, browns, and irridescent rainbow! We spent the bulk of the day exploring the artistic community of Toledo. 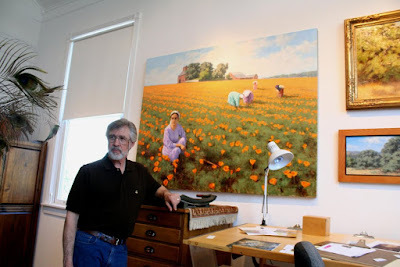 I am not much of an art enthusiast so it was not all that interesting to me but apparently Michael Gibbons is a fairly well known painter and we stopped by his signature gallery in Toledo as well as the one of Ivan Kelly, and a couple others. 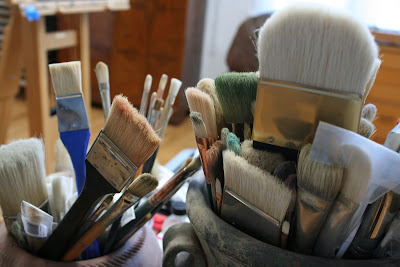 I shot this pic of Michael's paintbrushes. This is Michael Gibbons by one of the paintings on his studio wall. He is creating a very cool image of the ascension but it wasn't ready for prime time and he didn't want a photo. He even knew of my grandma Jane Leonard who is an artist and lived in Lincoln City for many years before moving to Sequim, WA. Everyone was very nice. We then ate at Pig Feathers BBQ(not a vegetarian friendly place but I managed to get a baked potato - or should I say nuked potato - a salad and the most delicious home-cut fries!! They also served us samplers of beers they are about to start brewing in a new microbrewery, and I had their sage-blueberry sauce and home-made spicy BBQ sauce with the fries. Very good! Then we visited the Yaquina Pacific Railroad Museum and the older man doing the tour was pretty animated and cute. I learned things like... three children got mailed on rail-cars as "baby chicks" before the practice was made illegal. 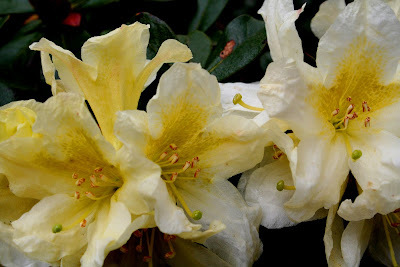 A self-portrait I took at the Gerdemann Botanical Preserve where we strolled around for a while after checking into our hotel in Yachats- the Overleaf Lodge. Another incredible property! 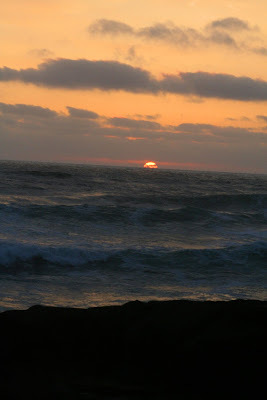 The Overleaf - in Yachats (population 697 or so!) 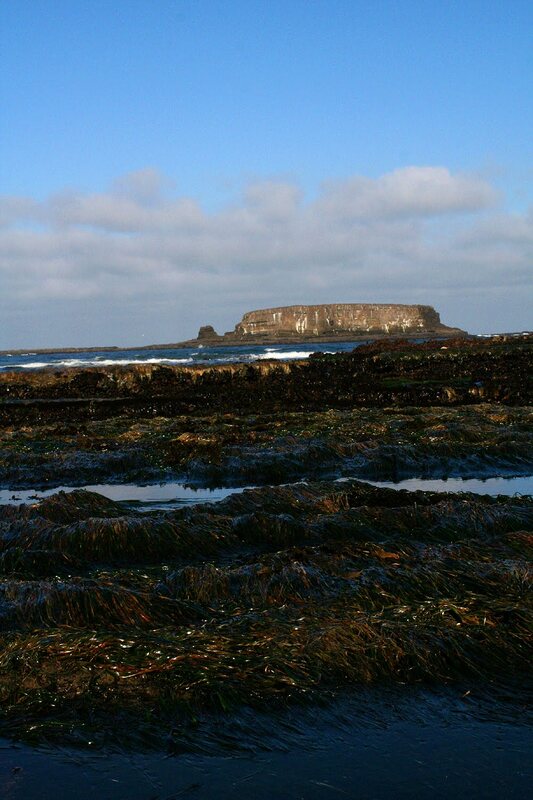 is situated on these lava-rock bluffs which remind me of the Galapagos. Very cool. I explored and photographed at sunset. There was a low cloud on the horizon so I didn't see the green flash. Bummer.